Quick chicken soup in the pressure cooker! Classic recipe with whole chicken (or chicken pieces), carrots, onions, and celery. Ready in 60 minutes. The minute anybody in my house comes down with the slightest sniffle, I run to the store for ingredients for chicken soup. It’s the go-to cure-all around here! The recipe I make is classic and very simple, but to get it ready even more quickly, I make it in the pressure cooker. 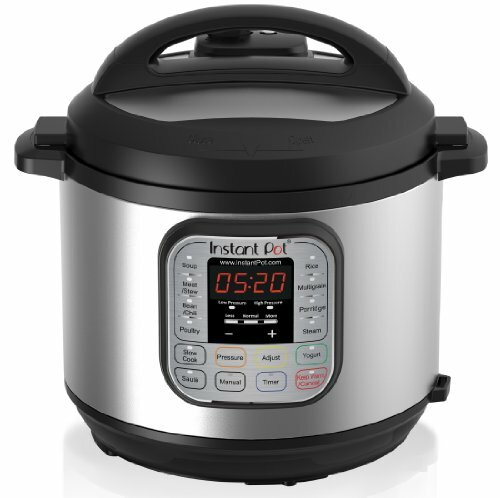 Pressure cooking in the Instant Pot (or any electric pressure cooker) reduces the cooking time a fair amount. Using an electric one also allows you to leave the pot unattended while it cooks. The cooker will even switch to a “Keep Warm” setting once cooking has finished so you don’t have to worry about turning off the cooker right away when the soup is done. Just throw all the ingredients in the pot, press a button, and come back to piping hot soup later on! I use a whole chicken for my soup for a few reasons: First, It’s the most economical way to go. Second, I like having a mix of white and dark meat. And third, all of the bones and cartilage help to create a rich, nourishing broth. You can also use any mix of bone-in drumsticks, thighs, or breast meat. Remove the skin if you like, but I like a little bit of rendered chicken fat in my soup! You’ll need a 6-quart or larger pressure cooker for this recipe. The pot should be just big enough to fit a 3- to 4-pound chicken. If you have a larger pressure cooker (8-quart or bigger), you can also get away with using a slightly larger chicken. Be careful when doing a quick-release because liquid-heavy pressure cooker recipes like this soup can release a lot of steam during the venting step after cooking. If you want to avoid the jet of steam entirely, you can wait for the pressure to release naturally. Just wait until the pressure cooker’s float valve has returned to its “down” position. This will take quite a while, though, since this recipe contains a lot of liquid. Good chicken soup made with the whole chicken will often develop a jelly-like consistency once chilled, so don’t be alarmed if this happens to you! The soup will turn back into liquid when warmed. For a more filling meal, you can stir some cooked noodles into the soup, or even make dumplings to cook on top. I prefer to cook the noodles separately so that they don’t absorb a ton of moisture from the soup itself. I mix them in just before serving, and store them separately from the soup in the fridge. To make chicken and dumplings, mix up a basic dumpling dough, spoon it over the finished soup, and lock the lid back on. Cook on “low pressure” for 10 minutes (or 8 minutes for stovetop pressure cooker, or 20 minutes simmered over low heat for stovetop). Stovetop Instructions: Put the chicken in a large soup pot or Dutch oven, breast side up. Add the rest of the ingredients to the pot, pouring in the water last to avoid splashing. Cover the pot and place it on the stove over medium heat. When the soup comes to a boil, turn it down to low and simmer, covered, until the chicken is tender and the meat is just beginning to come away from the bones, about 1 hour and 15 minutes. Continue with the remaining steps as described in the recipe below. 1 Put the chicken in the pot of a pressure cooker, breast side up. 2 Layer all of the other ingredients into the pot, pouring in the water last to avoid splashing. Adding four teaspoons of salt at this point will result in a well-seasoned soup broth. Use less salt or eliminate if you'd like to make basic chicken broth to use for other purposes. It will take about 35 minutes for your pressure cooker to come up to pressure, and then the actual cooking will begin. Total time from the time you seal the pressure cooker to the finished dish is about one hour. 4 When the soup has finished cooking, wait about 15 minutes before "quick" releasing the pressure. This helps prevent a lot of steamy broth spitting out of the valve. Even so be careful when releasing the steam! You can also let the pressure release naturally, though this will take quite a while. Wait until the pressure cooker’s float valve has returned to its "down" position before opening the pressure cooker. 5 Prepare the chicken meat: Use a pair of tongs or a slotted spoon to remove the chicken from the pot, and transfer it to a dish to cool until you can comfortably handle it, about 20 minutes. It may come apart as you are removing it from the pot, so go slowly and carefully. Take the meat off of the bones, and discard the bones, skin, and cartilage. Cut or tear the meat into bite-sized pieces. 6 Stir the chicken meat back into the soup. Ladle into bowls and serve. Let any leftover soup cool completely, then store in the fridge for up to 5 days or freeze for up to 3 months. The soup may gel as it cools; it will liquefy again when heated. Hello! All photos and content are copyright protected. Please do not use our photos without prior written permission. If you wish to republish this recipe, please rewrite the recipe in your own unique words and link back to How to Make Chicken Soup in the Pressure Cooker on Simply Recipes. Thank you! Best chicken soup recipe so far! Didn’t have parsnip or thyme, and used dill instead of parsley. I think garlic gave it an amazing aroma. Also used 2.5 tsp of kosher salt instead of 4. The whole family (including my 2 picky toddlers) loved it. Saving this one! I’ve made this recipe very many times. It’s the only way I make chicken soup now. It saves so much time, and energy. It tastes exactly like when I used to make it the “long way”. The only differences I make, are that I replace half the salt, with ground black pepper, and I also add 3 TBSP of butter. Thanks for the recipe! This recipe includes 2 quarts of water for a 6 quart instant pot. When I put all the ingredients in, I could only add 1 quart of water, otherwise the level will be above the 2/3 fill line. Alas, we didn’t continue this recipe. Please advise! Hmm, I’m not sure how only 1 quart of water would have fit. Was your chicken larger than 3-4 pounds, or were your vegetables especially oversized? Made many, many times and it’s a winner! Best chicken soup ever and you really get the benefit of the bones as I can attest too when it cools. I would half the salt. To add and Italian flair to this recipe I added a Large can of Stewed Tomatoes and a Parmesan Rind to the mix. I only have dried thyme and parsley. How much of each should i use? Hi, Ratna! I’d recommend using a half teaspoon of each. Enjoy! This is now our go-to chicken soup recipe – my kids LOVE it and now my mom has started making it and sharing it with all of her friends. I make one addition of 1 teaspoon of cumin, which really adds a nice dimension to the soup. Followed the recipe to the letter (didn’t have fresh thyme, used dried). Delicious. Made this last night and it turned out awesome. The chicken I used was a bit too big I think so I had to add a bit of extra broth at the end to even out the ratios but the flavour was incredible and it was super easy to make. Love being able to just toss everything in and forget it. Thanks for the easy and tasty recipe! Why place chicken in pot, pan or kettle *breast side up*? Too many recipes instruct this. Wouldn’t placing it breast side DOWN be more effective? Wouldn’t this drain or push the fatty juices from the dark meat through the considerably less fatty breasts with gravity and/or pressure? This is an interesting question! I don’t find that placing the chicken breast side up or down makes a difference in the tenderness or juiciness of the meat when it’s cooked in a soup. When the chicken is positioned this way, it’s easier for me to get my tongs in and remove it. You really can put it in there in any position you like, though! In a pressure cooker it doesn’t matter. Made this with a few tweaks. It was delicious! Now I have soup for the whole week! An easy way to remove the chicken fat (schmaltz) is to place the pot of soup in the fridge until the fat solidifies then scrape if off. I save it for frying eggs in or making Jewish style liver pate. This soup was amazing! I made without parsley and thyme which I did not have (do not care for thyme). I also added parsnip, a favorite of mine. Today I warmed up a bowlful and added beet greens. Yummy. I did the quick release, it was a little crazy with the steam and messy, next time I will hold a big mixing bowl upside down over it so steam can vent into it and drip into my sink. Usually I do natural release but here if you waited for that, the onion and celery would get pretty mushy. With these instructions, carrot and parsnip were just right, celery and onion starting to get mushy and garlic totally infused into the recipe. I released at 10 minutes. Sopa especial para os dias frios, deu água na boca assim que puder vou prepara. I have seen recipes that use separate chicken parts and pull the breast(s) out sooner, to add back at the end. The cooking removes most of the flavor from the chicken to make the soup. This was absolutely perfect. I gave some away and the friend texted that I must have a Jewish grandmother. So, thank you, bubbe for a great recipe to break in my Instant Pot. It is not recommended covering a pressure cooker’s valve when releasing pressure. Do so at your own risk and comfort level. i got a pressure cooker from my father in law this Christmas but i rarely use it, i’m stuck in my old habits i guess. i’m going to try this recipe! thank you for sharing! Thank you for recipe which is spot on. I made it tonight with a Kuhn Rikon pressure cooker and the time of 22 minutes under high pressure with a 15 minute cool down before pressure release was perfect. I used 4 drumsticks and 2 breast from a Trader Joe organic chicken pack and about 9 – 10 cups of water to fill the pot to its max 2/3 full line. Great recipe when feeling under the weather during California’s constant rain.